A modern villa for eight with a gorgeous Aegean Sea view. Villa Pindar is located on the beach close to Gennadi village on the south-eastern coast of Rhodes, just a few steps from the sea. A modern villa for eight with a gorgeous Aegean Sea view. Villa Pindar is located on the beach close to Gennadi village on the south-eastern coast of Rhodes, just a few steps from the sea. With a large, salt water pool, it's the perfect place for a medium-sized group to enjoy this tranquil part of the island. A large terrace provides a panoramic sea view and has a barbecue and dining area which is the ideal setting for a meal with friends. Sun loungers with parasols let you enjoy the reliably sunny climate that Rhodes is known for. The villa is architecturally striking and serves as an eye-catching backdrop to your time on the terrace. Inside, it's equally contemporary, with a spacious living room equipped with a large flatscreen TV, a big, comfortable sofa you can really stretch out on and a games room with games console. The sleek kitchen is equipped with a dishwasher, microwave, large fridge freezer and all the usual amenities. There are three bathrooms and two double bedrooms which open out onto the furnished terrace. There is also a bedroom with bunk beds for the children, and the large sofa-bed in the lounge serves as a fourth bedroom for two guests. Villa Pindar's proximity to the village centre is another plus point – restaurants, bakeries, cafes and beach bars are easy to find, along with useful amenities like a supermarket and pharmacy. Its position on the coast also makes it easy to reach some stunning sights to both the north and south. Among them, the beautiful beaches of Prasonisi and the natural wonders of Vouno Kalathos Park and the Epta Piges. Lindos with its famous clifftop Acropolis is only 20-25 minutes' drive from Gennadi, and if you want to head for the island's capital, you can reach it in around one hour. Almost anywhere you may encounter along the way will be worth stopping for – the stunning beaches and rugged scenery of Kolympia and Archangelos being just two examples. 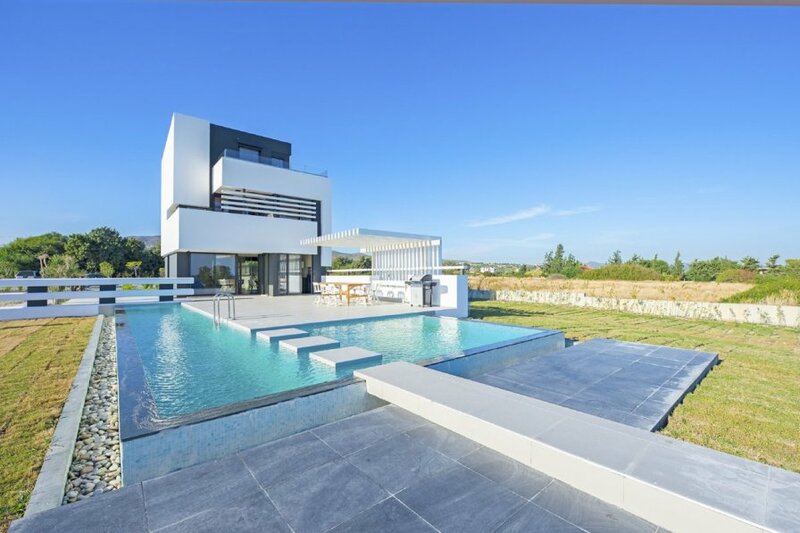 A modern villa for eight with a gorgeous Aegean Sea view. Villa Pindar is located on the beach close to Gennadi village on the south-eastern coast of Rhodes, just a few steps from the sea. With a large, salt water pool, it's the perfect place for a medium-sized group to enjoy this tranquil part of the island. A large terrace provides a panoramic sea view and has a barbecue and dining area which is the ideal setting for a meal with friends. Sun loungers with parasols let you enjoy the reliably sunny climate that Rhodes is known for. The villa is architecturally striking and serves as an eye-catching backdrop to your time on the terrace. Inside, it's equally contemporary, with a spacious living room equipped with a large flatscreen TV, a big, comfortable sofa you can really stretch out on and a games room with games console. The sleek kitchen is equipped with a dishwasher, microwave, large fridge freezer and all the usual amenities. There are three bathrooms and two double bedrooms which open out onto the furnished terrace. There is also a bedroom with bunk beds for the children, and the large sofa-bed in the lounge serves as a fourth bedroom for two guests. Villa Pindar's proximity to the village centre is another plus point – restaurants, bakeries, cafes and beach bars are easy to find, along with useful amenities like a supermarket and pharmacy. Its position on the coast also makes it easy to reach some stunning sights to both the north and south. Among them, the beautiful beaches of Prasonisi and the natural wonders of Vouno Kalathos Park and the Epta Piges. Lindos with its famous clifftop Acropolis is only 20-25 minutes' drive from Gennadi, and if you want to head for the island's capital, you can reach it in around one hour. Almost anywhere you may encounter along the way will be worth stopping for – the stunning beaches and rugged scenery of Kolympia and Archangelos being just two examples.